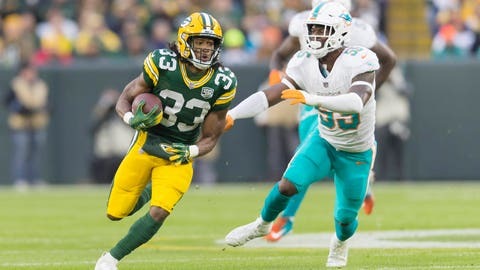 GREEN BAY, Wis. — Running back Aaron Jones‘ breakout game led to a breakthrough performance in the red zone for the Green Bay Packers. In Sunday’s 31-12 victory over the Miami Dolphins, Jones rushed for a career-high 145 yards and two touchdowns. With Jones taking some of the pressure off quarterback Aaron Rodgers, the Packers scored four touchdowns in four possessions inside the Dolphins 20-yard line. It was Green Bay’s first perfect day with more than one red-zone possession since Week 4 of the 2017 season. Their next test comes on Thursday night on the road against the Seattle Seahawks. Situational football — red zone and third down — has been troublesome for Green Bay’s offense all season. Before the Miami game, the Packers ranked sixth in total offense (406.6 yards per game), but were only 14th in scoring (24.0 points per game) because of inconsistencies on third down (17th, 39.4 percent conversion rate) and the red zone (19th, 53.9 percent touchdowns). Against the Dolphins, they gained 377 yards but scored 31 points, thanks in large part to their success in the red zone. The threat of the running game gives the Packers (4-4-1) another option as they advance toward the goal line. While Jones scored on runs of 2 and 10 yards, Rodgers threw touchdown passes of 7 and 25 yards to receiver Davante Adams to punctuate the other two red zone possessions. Adams is tied for second in the NFL with nine touchdown receptions. Of those, a league-high eight have come in the red zone. Since the start of the 2016 season, Adams has a league-high 22 red zone touchdown receptions. The closer to the goal line, the less space there is to operate and the more difficult it becomes to throw. Adams’ edge comes from being one of the NFL’s premier route runners. “Because the window is so tight, and he can create enough separation to where he makes that window bigger,” Rodgers said. With the emergence of Jones, the Packers have another weapon to use in their push for a playoff spot in the crowded NFC. Jones missed the first two games of the season with a suspension, then was part of a three-man committee in the backfield before taking over as the starter. In the three weeks since the bye, Jones has carried 41 times, Jamaal Williams has carried 14 times and Ty Montgomery was traded to the Ravens. “The more carries you get, I feel like the better you’re going to get and the more of a game flow you get in,” Jones said. Entering Thursday, Jones and Williams both have 73 carries. Jones, however, has rushed for 494 yards (compared to 270 for Williams) on a league-best 6.8-yard average. Jones had a 67-yard run in the first quarter against Miami, the team’s longest since receiver Randall Cobb had a 67-yard run in 2013. With Jones’ emergence to join Rodgers and Adams, the Packers hope they have the firepower for back-to-back road tests against Seattle and Minnesota. NOTES: The Packers held what coach Mike McCarthy described as a “very limited” practice on Tuesday before departing for Seattle in the evening. WR Randall Cobb (hamstring), CB Kevin King (hamstring), S Kentrell Brice (ankle), OLB Nick Perry (knee) were not traveling with the team, though the Packers said their game status would be updated on the final injury report on Wednesday.